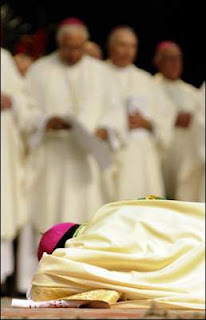 Whispers in the Loggia: "All in Our Little Backwater"
So, it happened -- after a vacancy of 17 months, Shreveport has its shepherd again... and the first episcopal ordination in the 40,000-member diocese's history made for quite the celebration... "Ecce sacerdos" et omnia. What's more, adding to the color, some of the reported 3,500 who were there have already sent up their impressions. [New Orleans Archbishop Alfred] Hughes and Duca also made it a point to thank Duca's parents, who live in Dallas and were seated in the front row. They received the second loudest round of applause for the afternoon. [At Sunday's Vespers service] Duca had a chance to say a few words. 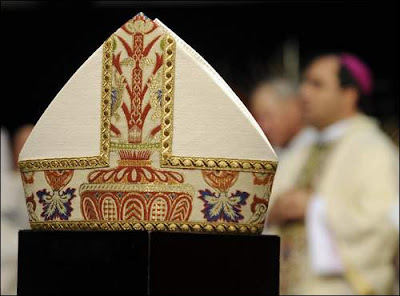 He spoke about choosing his episcopal motto: "Hope in the Lord." His first thought was to take a phrase from the letter to the Colossians, "Dedicate yourself to thankfulness." It's a phrase that has guided his spirituality for a while, and he found if you remember how blessed you are, then you learn generosity. But he didn't think that was broad enough. So he considered the phrase from the Gospel of John, chapter 21: "Do you Love me?" It's a question Jesus asks Peter as Jesus prepares to leave Earth. Peter responds "Yes, Lord, you know that I love you." And they repeat this exchange two more times. Duce said as he meditated on the scripture, he realized Peter's response was more - yes, Lord, I love in the way that I want to. You fill my spiritual needs and bring me peace. But that's not the question Jesus was asking, Duca said. Jesus was asking if Peter would love him when it was hard and uncomfortable and led to his death. In that sense, Duca though "Do you love me?" as a motto, would challenge him. But on it's face it might sound a little narcissistic, so he ditched it. Be sure you eat before you go. The liturgy almost lasted three hours. The Italians were really just about to bust today (This Diocese is a real Italian Diocese). Che gioia -- just makes you wish you were there, eh? One down, seven to go.